Sometimes you just have to stop what you are doing and gaze at the stars — or, in this case, at the full moon. We have been incredibly frustrated over the constant rain and the subsequent delay in our projects, especially when Weather Bug keeps telling us that there is a zero percent chance of precipitation while we are listening to thunder and watching sheets of rain increasing the size of the puddles all around the property. 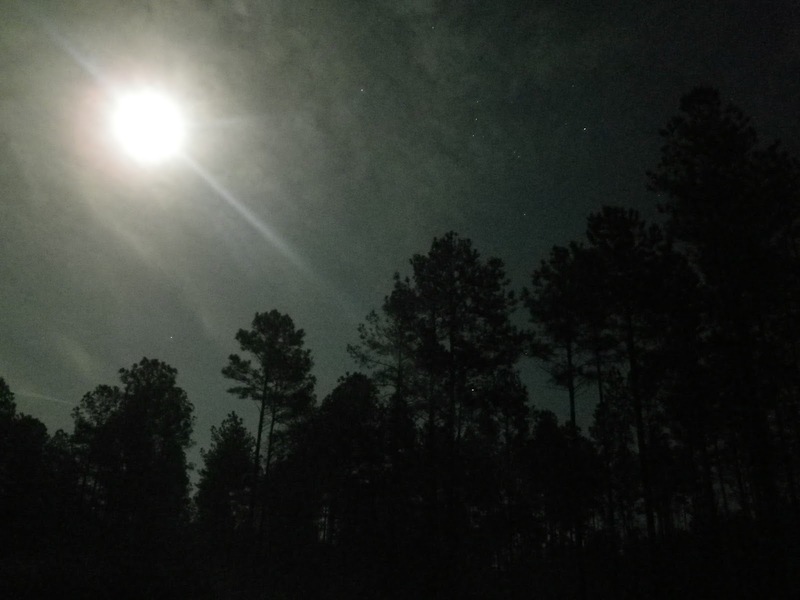 There was something magical about the intensity of the full moon and the clarity of a plethora of stars that night that I couldn’t capture on film. The peace and awe felt is in no way diminished by the limitations of my camera and the time I spent out there that night will sustain me through the second half of the school year. Sometimes we have to stop to gaze at stars when things get in the way of our goals and sometimes we have to stop and gaze back at memories of starry nights when responsibilities feel overwhelming. I will hold on to the memory of an incredible night-time walk in the woods to get me through those stressful times.